Here we are in October. 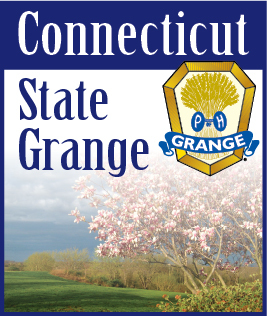 Our grange year is ending and a new year will soon begin. Our CWA contests have been judged at Celebration Day and the first place needlework winners have competed in the New England finals at the Big E. Thank you for all the beautiful entries and congratulations to all. You’ll be able to see the winning needlework and the craft entries on display at the State Session. I hope many of you will be able to attend at least a part of the convention. We’d especially like to have you come on Friday afternoon when we’ll be reporting on all the good work you’ve done – your donations of money to our State Projects, toys and comfy covers for Covenant To Care and pajamas and memory books for Foster Kids as well as other items for children in need. We’re very grateful for all you do. We’re also very thankful for the hundreds of handmade items you’ve sent to be sold at our Country Store in the Grange Building at the Big E. Thank you also to those of you who came to work in the store. We really appreciated it. For the start of our new year, the CWA Regionals will take place, as usual on the four Saturdays following State Session: October 24 at Norwich, October 31 at Redding, November 7 at Good Will and November 14 at Cheshire. All the meetings will start at 1:00p.m. If there are any changes to this schedule we will notify the Pomona Chairmen. It’s important for all of the Subordinate and Pomona Chairmen to attend these meetings. All the packets of information and instructions for the 2010 year will be distributed. We encourage anyone interested in our program to join us at any of these conferences but we especially hope the Masters and Committee members will come. See you soon.